9K Yellow Gold Medium Weight Soldered Jump Ring D 5mm wire 1mm..
9K YELLOW GOLD SOLDERED JUMP RING 0.9X6MM 27-41-6009/SC..
9KT GOLD SOLDERED JUMP RING 0.9 X 5MM 27-41-5009/SC..
Gold Filled Yellow Soldered Jump Rings, external D 6mm, wire 1.2mm. Approx. 7 jump rings in 1gr. 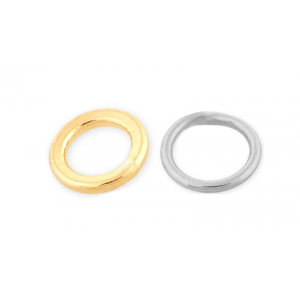 ..
Sterling Silver 925 Soldered Round Jump Rings 10mm, wire 1.2mm. Sold per pack, 10pcs. Approximat..
Sterling Silver 925 Soldered Round Jump Rings 10mm, wire 1mm. Sold per pack, 10pcs. Approximatel..
Sterling Silver 925 Soldered Round Jump Rings 5mm, wire 0.8mm. Sold per pack, 10pcs. Approximate..
Sterling Silver 925 Soldered Round Jump Rings 6mm, wire 0.9mm. Sold per pack 10pcs. Approximatel..